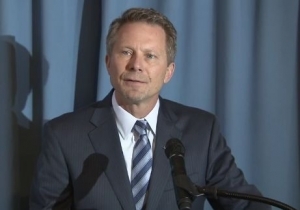 Kevin Guskiewicz, newly appointed interim chancellor at UNC-Chapel Hill. When Kevin Guskiewicz was named interim chancellor of UNC-Chapel Hill this week, he was hardly an unknown quantity. Guskiewicz joined the faculty at UNC-Chapel Hill in 1995 and has been dean of the College of Arts & Sciences since 2016. In that role he’s been no stranger to tensions between faculty, students and administration. Guskiewicz has been criticized by students for what they say is a weak response on two sexual misconduct allegations by the founder of the Institute of Politics, Tanner Glenn. As laid out in a recent piece in the student newspaper, The Daily Tarheel, students feel Guskiewicz did not act quickly or seriously enough on the allegations – and didn’t do so with transparency. Last semester, Guskiewicz was drawn into the controversy over the “Silent Sam” Confederate monument that led his predecessor, Carol Folt, to step down from her position. Guskiewicz and provost Bob Blouin wrote an e-mail discouraging faculty and instructors from supporting the withholding of last semester’s final grades over opposition to the “Silent Sam” Confederate monument. The email warned of legal ramifications if they participated in the protest action. Ultimately, the final grades were released in time to avoid any consequences for either students or instructors. But Guskiewicz’s dust-ups with faculty go back further. In 2017, he was part of a case wherein a faculty member filed a grievance over being prevented from teaching a class on the history of sports. The class touched on the UNC athletic scandals of recent years. Though an independent faculty grievance committee at UNC found administrators’ behavior in the case had been “inconsistent” with UNC’s commitment to academic freedom, UNC leaders rejected that committee’s conclusion that administrators had meddled in the affair. Some faculty members are talking this week about their discomfort with Guskiewicz as interim chancellor – and his announcement that he will seek the position full-time. But Leslie Parise, chair of the UNC-Chapel Hill Faculty, provided a statement of support for Guskiewicz on the day of his appointment. How Guskiewicz navigates these ongoing controversies as the school’s new leader remain to be seen.